Your Dressmaker brings you the utmost in beautifully handcrafted womens historical clothing. Our vast selection includes medieval and Renaissance dresses fit for any character, from peasant maiden to magnificent queen, as well as the petticoats, hoop skirts, corsets, and more to help you achieve the authentic silhouette of your chosen era. Select from a variety of capes and cloaks that range from essential and durable to luxurious and layered. 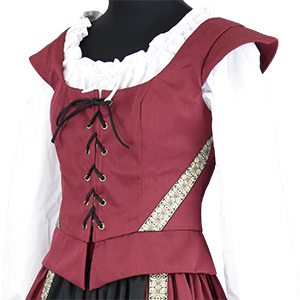 Of course, any woman looking to recreate an authentic historic look has to check out our selection of easy-to-wear medieval chemises, ranging from short blouse styles to long and full medieval gown chemises, ideal for wearing with skirts or under dresses and vests. Highlight your figure and your outfit with our medieval waist cinchers, or retain an aura of mystery in our beautifully hand detailed ritual robes and hooded dresses. For a unique Renaissance look, try one of our stylish baroque vests. No matter what your historic occasion, Your Dressmaker has the medieval and Renaissance clothing to suit your style, all expertly handmade out of high quality materials with incredible attention to detail. 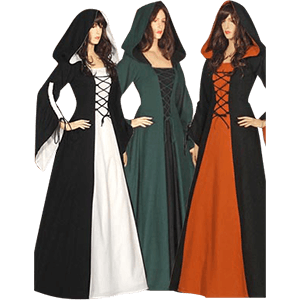 Many of our medieval apparel is available in a variety of colors, patterns, and fabrics, and much of our womens medieval clothing can even be tailored to suit your individual size. Wear our medieval dresses, shirts, robes, and jackets for Renaissance festivals, historic live action roleplay, theatrical productions, or any other historic reenactment event that calls for exceptional period style. Your Dressmaker offers an assortment of medieval and Renaissance bodices and corsets that will help you obtain a historical hourglass silhouette or add extra appeal to your outfit. Whether you are dressing up for a Renaissance festival, historical reenactment, theatrical production, or simply love the look of historical corsets, you will find all our overbust corsets, underbust corsets, and medieval bodices here. These corsets and bodices are handmade with attention to detail and with historical styles as their base or inspiration. 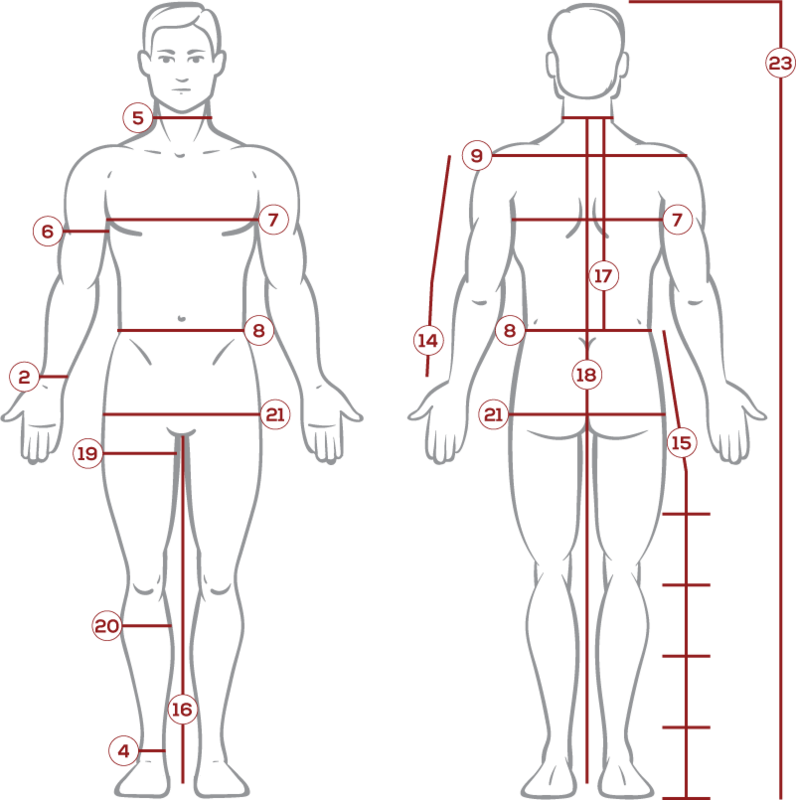 They can also be custom tailored to fit your sizing needs or fabric preferences. Bodices are great for wearing over medieval blouses and dresses, and our corsets can be worn over or under different garments, depending on their style and the type of look you are going for. 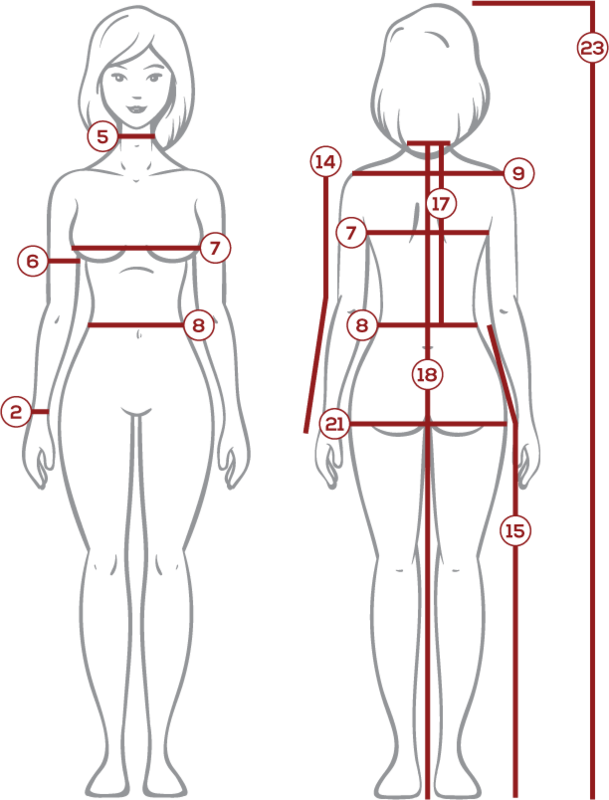 For your next corset or bodice, choose Your Dressmaker for a finely handcrafted and beautiful addition to your wardrobe. For womens capes and cloaks handmade with expert skill and high quality materials, choose Your Dressmaker. Drape one of our cloaks or capes over your shoulders, and you will instantly transform any historic outfit into a full ensemble. Whether you seek historic outerwear to match any look, a luxurious covering for colder climates, or simply an additional layer that is both easy-to-wear and made with care, Your Dressmaker has the historic capes and cloaks you need. Practical and versatile, many of our medieval capes are made from natural woven cotton for a durable and authentic look. Dress for warmth and luxury with a hooded cloak made from soft faux suede. We offer a wide variety of fur trimmed capes and cloaks, ideal for wintery medieval looks. 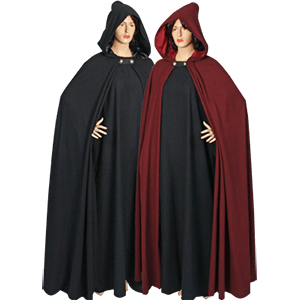 Explore our selection of medieval cloaks suitable for peasantry as well as our lavish medieval noblewomens capes for regal flair. Shop Renaissance style cloaks, made from elegant brocade and lined with satin and available in a variety of lengths and styles, including layered cloaks. Shorter cloaks are great for adding style and warmth without bulk and still showing off the rest of your historic outfit, while our longer medieval hooded cloaks are perfect for comprehensive coverage. Expertly crafted, each historic cloak can be custom tailored to best suit your unique needs. Wear our medieval capes and cloaks for your next Renaissance festival, historic reenactment, theatrical production, medieval LARP, or other special event that calls for incredible period style. Every great outfit starts with a good base. Keep your historic ensemble authentic down to its innermost layer with a womens medieval chemise from Your Dressmaker. These essential undergarments make the perfect base for any historic look. Our chemises are made out of comfortable and breathable fabrics, such as cotton or rayon, so they are ideal for wearing under more elaborate period garments. Choose a full length, wide sleeve chemise to wear under medieval gowns, or combine a shorter blouse chemise with a full historic skirt. Throughout history, women across all classes wore chemises as a preferred underlayer, so we carry a wide variety of historic underdresses and blouses to suit any need, ranging from Norse and Celtic chemises to specialized garments like our Italian Renaissance style chemises. Your Dressmaker offers historic chemises in a broad selection of sleeve and neck styles, from ruffled sleeves and high collars to versatile and adjustable lace up necks, so you are sure to find a chemise that will work as the underlayer of any look, no matter your occasion. Our medieval chemises are must-haves for any historic outfit, so dont go to your next medieval reenactment, LARP event, or Renaissance festival without one! Expertly handmade and designed for comfort, our historic underdresses can be individually tailored to suit your preferred size. The expert craftsmanship and astonishing attention to detail of Your Dressmaker truly shines in our incredible selection of womens medieval dresses and gowns. Here you will find medieval peasant gowns alongside elaborate and regal Renaissance dresses befitting grand ladies of the court. These intricately detailed period dresses are inspired by the styles of eras long past across a variety of cultures, and our assortment includes Italian Renaissance dresses, the royal Victorian dresses, baroque gowns, Highlander dresses, Tudor dresses, and even medieval fantasy dresses. High quality materials make up each of our historic dresses, so shop here for brocade Renaissance gowns, velvet dresses, silk and taffeta baroque dresses, Scottish tartan dresses, and essential natural woven cotton medieval dresses. Made by hand, our dresses can be tailored to fit your unique size, making it easier than ever to get the look of your dreams. Whether your event calls for an ornate ball gown or a country maiden dress, we have medieval raiment of the highest quality ready to represent your unique taste with historic authenticity, style, and unmatched beauty at your next historic reenactment or special occasion. At Your Dressmaker, our womens medieval jackets are handmade out of fine quality materials and expertly crafted with incredible detail. Many of these historic jackets feature a menswear-inspired structure that has been altered to better suit a feminine figure, sure to give you a unique look at your next historic reenactment event. 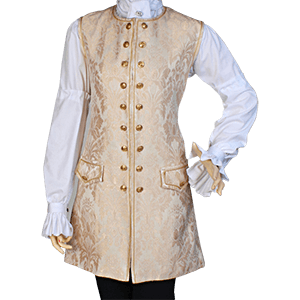 Our womens historic jackets incorporate elements of Victorian tailcoats and long Renaissance frocks, such as ornately patterned fabrics, intricate details, and embellished cuffs and lapels. Browse our variety of historic outerwear, including Victorian style frock coats and womens baroque frocks made from beautiful brocade with velvet lapels and cuffs. Many feature an inner satin lining for an extra touch of elegance. 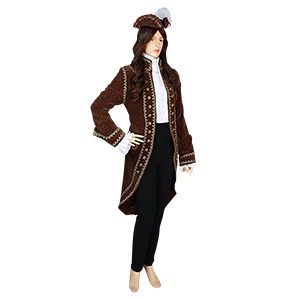 Our open front baroque jackets and Victorian tailcoats are available in luxurious antique velvet, a lovely addition to a Renaissance noblewomans clothing, and our womens Renaissance jackets can be custom tailored to help you achieve your best fit. Available in a wide variety of colors, styles, and high quality materials, our medieval and Renaissance jackets are a unique option for your next historic reenactment, Renaissance festival, LARP event outfit. Their high level of authentic detail makes our womens jackets great costumes for theatrical productions as well. To get the authentic silhouette and full skirted look popular in most period styles, proper underskirts are a must. Your Dressmaker offers a variety of high quality petticoats and hoop skirts to help you wear your favorite historic skirt or Renaissance dress in its intended shape. Popular skirt silhouettes varied throughout history, so we carry a variety of undergarments to help you achieve the most appropriate look. 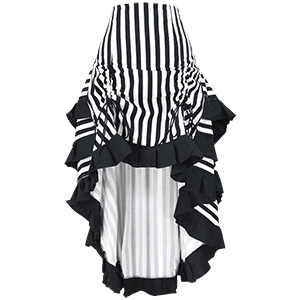 Shop our selection of bum rolls, bustles, cage skirts, and Farthingales for the historic structure, padding, or layers your reenactment outfit needs. Shop everything from modest and essential A-line petticoats to voluminous and layered Civil War hoop skirts and intense Renaissance panniers. Many contemporary skirt and dress styles can also benefit from added volume, so our selection includes easy-to-wear and comfortable petticoats for achieving a classic and romantic look for modern special occasions, such as weddings or balls. At Your Dressmaker, we are able to custom tailor our petticoats and hoop skirts to suit your particular sizes and unique needs, making it easy to get the right look for your next historic reenactment, Renaissance festival, or upcoming special event. Whether you are preparing for a secret ceremony, attending a Celtic gathering, or merely dressing up as your LARP priestess character, Your Dressmaker has the womens medieval ritual robes to fit your unique needs. Our womens robes are handmade with expert attention to detail, and many feature handcrafted trim for added authenticity and style. More than the robes of clandestine occultists, our ritual robes are multipurpose staples for any historic reenactment wardrobe. Choose from a variety of styles, including womens medieval tabards, long sleeve robes, bell sleeve gowns, hooded ritual robes, and unique hooded robe styles for a look that suits your character, all made out of high quality materials ranging from natural woven cotton to soft faux suede available in an assortment of colors. Wear a hooded ritual robe to give your ensemble an air of mystery, or wear an embroidered ritual robe for a look befitting medieval nobility. With our custom tailoring, variety of high quality materials, and expert handcrafted construction, our medieval apparel essentials are sure to become great bases for your next medieval or fantasy LARP costume, Renaissance festival outfit, or other historic reenactment ensemble. From the blouses of Renaissance royalty to peasant chemise tops, Your Dressmaker carries an assortment of womens medieval shirts to suit a variety of historic looks. Made from breathable fabrics like cotton, rayon, and linen, many of these high quality historic shirts are expertly handmade for both comfort and historic authenticity and can be custom tailored to fit your needs. The womens medieval tops in our assortment are rather versatile, featuring adjustable collars and sleeves that can be worn either loosened or tied, and our styles range from form fitting and flattering to comfortable and flowing. Our medieval chemise tops are great for combining with a medieval skirt and belt for a stylish wench or peasant maiden look, while we offer many ruffled Renaissance blouses that can be successfully styled for wealthy merchant or noblewoman outfits. 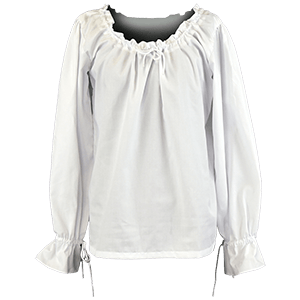 Many of our womens historic shirts are even great for the outfits of fantasy or pirate characters. Shop our beautiful Renaissance lace trim shirts, gothic chemise tops, casual off shoulder medieval shirts, country maiden blouses, Victorian high collar shirts, and even peasant style crop tops when assembling your next LARP-worthy outfit, historic reenactment ensemble, or Renaissance faire look. For beautifully flowing medieval skirts, voluminous and full Renaissance skirts, country maiden skirts, and elegant skirts suited for ladies of the court, choose Your Dressmaker. Our selection includes expertly handmade period skirts from a variety of historic eras. Paired with one of our versatile chemises, corsets, or womens medieval blouses, our historic reenactment skirts are essential in creating stunning and unique outfits to wear to your next Renaissance festival or medieval themed event. Your Dressmaker can also custom tailor skirts to suit your specific size. 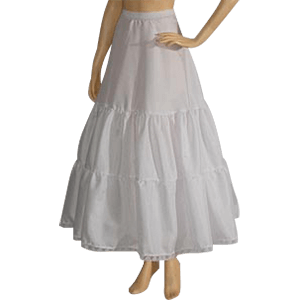 Our medieval skirts come in authentic colors and high quality fabrics, such as 100 percent natural cotton that has been textured for a rustic appearance. Lose yourself in the layers and folds of our full skirts, which look their best when worn over one of our petticoats or hoop skirts. Expert gathering, pleating, and other carefully crafted details give our Renaissance skirts their authentic look. Our medieval maiden skirts are excellent additions to any historical reenactment wardrobe, as they can be combined time after time with different tops for a variety of unique looks suitable for historic LARP, Renaissance reenactments, theatrical productions, and more. At its core, a vest is a sleeveless top that is, to some degree, fitted to the body. The shapes, styles, and fabrics of womens vests have varied throughout time, and Your Dressmaker aims to bring you a wide selection of womens medieval vests, Renaissance vests, and more historic reenactment vests in various fashions from across eras, cultures, and classes. Shop here for essential peasant vests, country maiden vests, womens medieval tunic vests, and more. Handcrafted with attention to detail and quality, our historical vests are made out of high quality fabrics. Shop our menswear inspired womens Baroque vests for a unique and distinguished Renaissance look. These stunning period vests are beautifully detailed for a truly noble appearance that is both authentic and timeless. Our brocade and satin vests are designed with a womens figure in mind, and many of our historic vests can be custom tailored to fit your needs. Whether you are seeking a medieval vest to wear at your historic or fantasy LARP event, an ornate noblewomans vest for a unique Renaissance festival outfit, or the perfect addition to a theatrical production costume, find your historic reenactment vest here at Your Dressmaker.